The topic of the following piece isn’t appropriately suited for my hot sauce blog, scottrobertsweb.com, and also it may not technically fit snuggly into the Christian author-oriented essaying of this site, scottrobertsauthor.com; but I’ll stick it on here because, well, I make the rules concerning what appears and what doesn’t, and you don’t. Ha! As the title of this post clearly spells out, I’m referring to playing my favorite musical instrument in the world: the guitar. An enormous part of who am I, or at the very least, who I wanted to be at one point, is a guitar player. I had been severely bitten by the guitar bug somewhere around the tender age of twelve, right at the height of Van Halen’s massive popularity, before vocalist David Lee Roth left the group in 1985. Like literally millions of other aficionados, I was enthralled by Eddie Van Halen’s inventive guitar stylings. The guy was like a Thomas Edison to the instrument, both in terms how it was played and the equipment surrounding it. I might pen a blog post sometime in the future on what I thought Eddie’s most impressive innovations were. My mom finally gifted me with my first guitar on Christmas 1986. 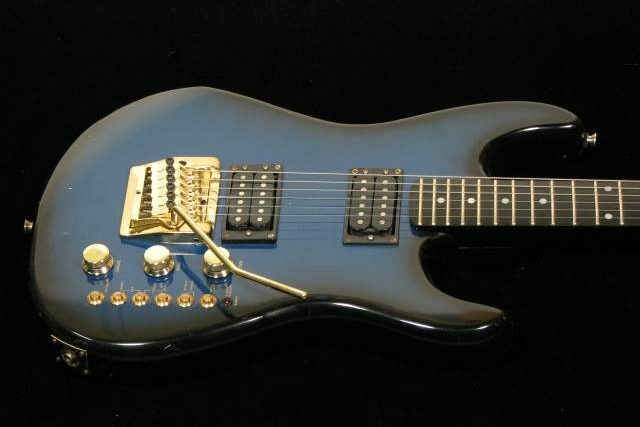 It was a Strat-style axe sold through the Sears Catalog call the Cort Effector. Sure, it was a cheapo instrument, but it actually stayed in tune surprisingly well, boasted good string action, played decent, looked sharp with the black and blue “sunburst” look, and…had a slew of built-in effects. Yep, that’s right…this puppy had electronically-manipulated guitar effects that were factory-installed right inside the body available at the touch of a button. Refer to the photo below of the same model. I recall the Effector came equipped with a phase shifter, delay, vibrato, wah, chorus and a lovely, fuzzy distortion. I immediately got to work on learning. I took approximately four half-hour lessons from one of the instructors at the now defunct Fenton Music in Fenton, Missouri. The teacher never really made any real effort to show me any legitimate guitar fundamentals, and only demonstrated parts of Van Halen’s “Runnin’ With the Devil” for me to mimic. I quickly got bored with this. In the meantime, I ordered a mail order guitar tutorial series called Metal Method, created by instructor Doug Marks (upon checking out that link, I’m giddy to see that ol’ Doug is still around to this day, as spry as ever, teaching new generations how to crank it on guitar). This multiple booklet and cassette-based course was refreshingly thorough, giving the 14-year-old me the necessary groundwork for barre chords, licks, scales and even music theory. What I haven’t mentioned yet was that I also received Van Halen’s full-length concert video Live Without a Net for Christmas in ’86. This VHS tape captured the band performing their latest hits live with new vocalist Sammy Hagar. This video became a permanent fixture in the VCR in my bedroom, only temporarily getting ejected for the infrequent movie rental. Without exaggeration, I played Live Without a Net virtually every single day for over a year, prudently studying Eddie’s guitar techniques, rewinding and reviewing specific parts, and jamming along with the songs on ol’ Black n’ Blue (what I named my guitar). Quite literally, I wore out my copy of that VHS tape! I replaced it with another VHS cassette, but I never did obtain a DVD version of LWAN when that format debuted in the late 1990s. I loved everything guitar-oriented from blues to classic rock to metal, and even some country and jazz, and immediately became acquainted with whoever the player was whenever I heard a song containing some of their ingenious playing or riffing. It was like, “who is that playing with Elvis?” Found out it was Scotty Moore, and dug into his back catalog. “Who’s squeezing out these soulful slide lines on Bob Seger’s ‘Like a Rock? '” Ah, it was Rick Vito. “WOW! Who on earth is blasting this heart-wrenching stuff in this tune called ‘Parisienne Walkways? '” I discovered it was virtuoso Gary Moore. Besides Van Halen, the other major six-string influences that had accumulated along my teenage journey were: Ozzy Osbourne’s late sideman and wunderkind, Randy Rhoads; neoclassical Swedish transplant Yngwie Malmsteen; state-of-the-art technique monsters Steve Vai and Joe Satriani; Texas blues boss Stevie Ray Vaughan; Christian guitar prodigy Phil Keaggy; Nuno Bettencourt of Extreme; clean-sounding axe whiz kid Eric Johnson; and Kevin Bacon. Okay, I’m totally kidding about that last name. I wanted to see if you were still playing attention. Anyway, I never mastered the alternate/sweep picking dexterity pushed forward by speedster guys such Yngwie, et al., so my own playing output was a sloppy combination of hyper-pentatonic/hard rock lead players like Van Halen and thrashy rhythm kings such as James Hetfield of Metallica. Equipment-wise, I graduated to using mainly Fender Stratocasters (my main ones were black and cream-colored Strats) run through Carvin tube amplifiers cranked to 11. I usually relied on the amp itself for clean tone and distortion, yet I occasionally employed foot pedals such as the Digitech MULTI PLAY Effect Pedal for an assortment of delay and digital sampling/looping sounds and the legendary purple Boss BF2 Flanger for more swirling, spacey tones. It was my way of approximating an updated, Van Halen-influenced “brown sound” for the early 1990s, while I bounced back and forth between having 7-Up-like crisp n’ clean and thicker, muddy n’ dirty tones. I played guitar (and sometimes keyboards) in a few St. Louis area bands – a couple of which had obscene names that I’d rather not print out on this Christian blog! Other semi-mentionable ones were Baby Seal Target Practice, and brief stints in the Egyptsies and even the first band that St. Louisan Jeremiah Johnson had formed while he and I attended high school together, which was dubbed DetarX (read that backwards if you want to understand the inspiration behind the name). Then the ’90s came upon us and graced us with individuals of minimal talents spearheading the alternative rock movement. Many of us rockers who cared about both complex and fun songwriting, in conjunction with skilled playing technique, almost found ourselves without a home in the music industry. Competent guitar playing fell out of vogue, and instead the same numbingly banal chords, flannel-shirts and navel gazing were the rage of the day. I gravitated towards newer metal players such as “Dimebag” Darrell Abbott of Pantera as ones still carrying the torch for fist-pumping rock and roll during the depressing, dark ages of grunge. During my college years, I gave guitar lessons to a few younger guys in the area for $10 a pop. Combating the frustration I had as a student trying to take lessons five years prior, I wanted to make sure my students got a well-rounded musical education and received their money’s worth, and exhaustively taught them excellent building blocks on which to construct their own sonic opuses. 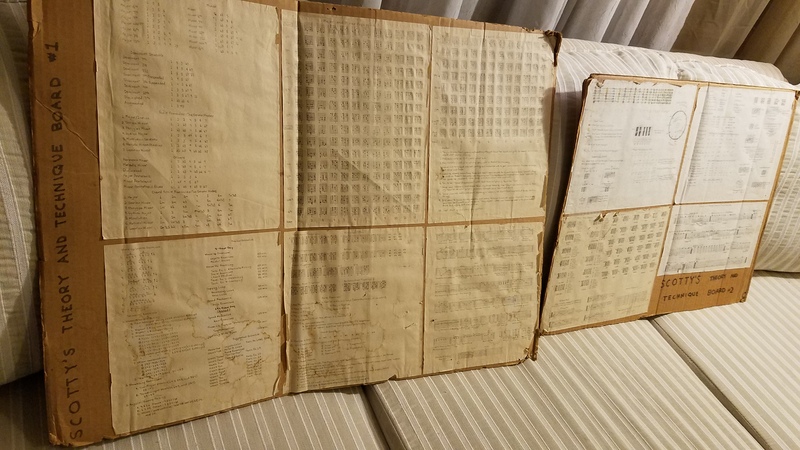 One of my “secret weapons” as a teacher was a pair of portable boards with several pieces of printer paper glued on them. On each sheet were hand-drawn scale charts, chord charts, arpeggio patterns, a tablature legend, and many more technique and music theory-drenched figures. I worked long and hard on these boards. The result was an impressive, encyclopedic resource that any student of the instrument could quickly refer to, and the kids I tutored were no exception. They were blown away. Nowadays, there is everything from guitar posters to smartphone apps to websites that will build tablature for you. Obviously, the technology we have here in the 2010s didn’t exist back then, but I don’t remember chart posters being prevalent in the 1990s. I still have these homemade boards to this day, and are in decent condition, despite being marred by water stains and cat scratches. Scotty’s Theory and Technique Boards 1 and 2. By now, was well into the mid-1990s, and the music scene was the polar opposite of what it was just five years prior. For guitar slingers like me with a dream of one day making it big, it seemed as though those plans blew away like vapor. The pop hits of the day, like “Tubthumping” and “Bitter Sweet Symphony,” didn’t even need guitar. And groups such as Limp Bizkit or Deftones that did have some bottom-heavy 6-string (or 7-string) action just…well…were kind of uninventive and boring to me. There was no fun or joy, let alone foster a climate friendly to innovative fretwork, in music anymore. Life lead me to eventually get work as a manager of a Subway before settling into a long, storied career in IT as a website developer. I jumped into a lousy marriage, but I was blessed with a couple of great sons from it. For the most part gave up on the dream of making it in the music industry. As the decade was coming to a close, a jet black Peavey Wolfgang Van Halen had became my main instrument. I sparked a friendship back up with an old high school classmate…let’s just call him “Linus Stallman,” who later with his wife turned out to be con artists. With Linus, I started an online guitar website. We featured music news, playing tutorials, and in-depth product reviews. 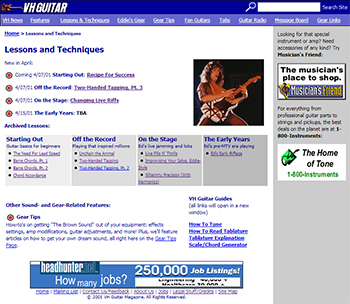 The Lessons page of the now defunct VHGuitar.com website as it appeared in 2001. After Linus stole musical equipment that was to be clearly “try out and return” for reviews – and also duping me out of thousands of dollars – I booted him from my life and the guitar website, and I ran it solo for a while. 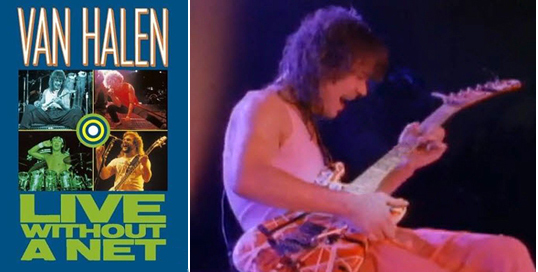 It metamorphosed into a purely Van Halen-based guitar resource (with most of the previously-written guitar articles still available in the site’s archives) and was renamed and re-branded into VHGuitar.com. This site marked the third Van Halen website I was running simultaneously; the others being VHTrade.com/VHTrading.com (a bootleg trading and early BitTorrent community) and VHFAQ.com (as the name suggests, FAQs and info about the band, much of which eventually made it onto the Van Halen Wikipedia page). I wanted VHGuitar.com to be the quintessential resource for everything that had to do with Eddie’s playing techniques and his gear. My overall interest in Van Halen waned drastically during the first half of the next decade, and I eventually ceased maintaining the various websites. The “nail in the coffin” moment for me regarding VH was their ill-fated 2004 reunion tour with Sammy Hagar. Eddie’s inexcusably sloppy and drunken playing was a complete embarrassment the night I attended in my hometown of St. Louis, Missouri. I knew that the band was finished creatively, and I swore never to spend another dollar on Van Halen ever again, I promise I have kept to this very day. I still loved to jam every now and then, but with the dual responsibilities of a full-time tech job and watching my two toddlers most evenings (my wife worked nights), I never got back to playing like I once did. 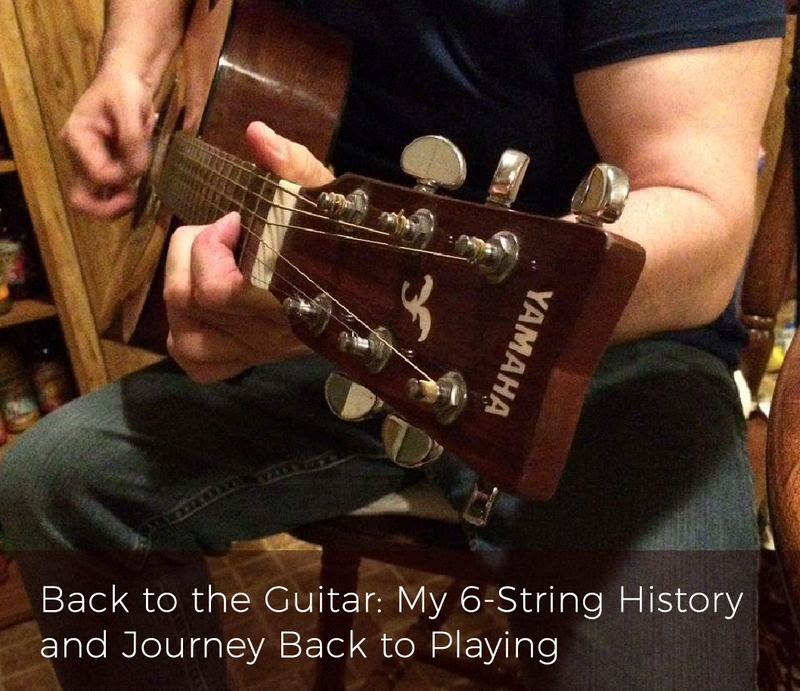 The fire…the drive…the once consuming passion to be all things six-string was slowly being snubbed out. The event that really did me in was another job firing for my wife. Between mountains of her back medical bills and this recent termination, she and I were in a dire straits financially. Facing already-late bills and an impending rent payment, we had to do something quick. Yeah, you can guess what happens in the story. For me, that “something quick” was to sell off my guitar gear piece by piece. It didn’t take too long to sell off my equipment (and believe me, I sold every last piece of it), and gave my wife and I some room to breathe. Unfortunately, my nearly 20-year-long love affair with the greatest musical instrument of all time had taken its last breath. Well, of course not! But you’re going to have to wait until part two for the comeback! Stay tuned!